Summer is an ideal time to pursue an undergraduate research experience, as students may not be taking classes and can devote more time to research. Summer research opportunities are available at MSU as well as off campus. The opportunities listed below are mostly off campus opportunities. Carefully review each positing and note deadlines that often fall in late January through early March prior to the summer. The BEACON Center for the Study of Evolution in Action approaches evolution in an innovative way, bringing together biologists, computer scientists, and engineers to study evolution as it happens and apply this knowledge to solve real-world problems. 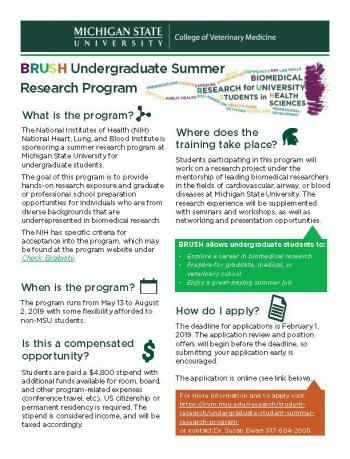 The National Institutes of Health (NIH) National Heart Lung and Blood Institute and MSU sponsor the BRUSH Summer Research Program for undergraduate students interested in the biomedical sciences and research-related careers. Under the guidance of Columbia Business School’s leading faculty, interns will take an active role on a research project in areas such as: accounting, economics, finance, marketing, management, decision sciences, operations, and data analytics. This internship and work abroad opportunity allow students and professionals to develop the expanding set of competencies demanded in today’s global economy through sustained immersion in a foreign country. The DOE Scholars Program offers unique opportunities that introduce students or post-graduates to the mission and operations of the U.S. Department of Energy. The U.S. Department of Homeland Security (DHS) Science and Technology Directorate Office of University Programs sponsors a 10-week summer internship program for students majoring in homeland security related STEM disciplines. The Doris Duke Conservation Scholars Program responds to this need by increasing the number of undergraduate students from underrepresented groups who choose to pursue coursework and careers in conservation. The Immigration and Border Community – REU, is a unique opportunity to learn social science research methods while collaborating with local organizations to conduct in-depth research about the unique challenges faced by border communities. This collaborative project is building a database of all 350,000 lakes in the continental US that is the basis for studying how lakes respond to changes in climate and land use across broad scales. The Mickey Leland Energy Fellowship (MLEF) Program provides college students with an opportunity to gain and develop research skills with the Department of Energy’s Office of Fossil Energy for 10 weeks over the summer. For individuals interested in furthering their experience in the Earth sciences and remote sensing, including currently enrolled students, recent graduates, early career professionals, and transitioning career professionals. The NIDA Summer Research Internship Program supports all students with a focus on increasing underrepresented populations in drug abuse research. This website helps you examine opportunities in the subject areas supported by various NSF units. Also, you may search by keywords to identify sites in particular research areas or with certain features, such as a particular location. Oak Ridge Institute for Science and Education (ORISE) is a Department of Energy facility managed and operated by Oak Ridge Associated Universities. Summer research opportunity for MSU undergraduate, graduate, or medical health professional students from under-represented, minority, and disadvantaged groups.. Application deadline is October 15th. The Science Undergraduate Laboratory Internship (SULI) program encourages undergraduate students to pursue science, technology, engineering, and mathematics (STEM) careers by providing research experiences at the Department of Energy (DOE) laboratories. Search the SORS Guide to find an opportunity within one of the Smithsonian units that matches your study and/or research goals. The SROP program aims to increase the number of underrepresented students who pursue graduate study and research careers. This research program can provide up to full funding for a summer experience. The University of South Florida offers a summer research opportunity for rising sophomores. This is a 9 week, mentored research opportunity and includes a weekly stipend. Application deadline is February 1st. Applications for the BRUSH summer program are due February 1st. Apply for the Biomedical Research for University Students in Health Sciences (BRUSH) Summer Research Program.